Named for a Polish saint, Stanislaus Kostka, the Saint Stanislaus Society of Turners Falls was Lodge 549 of the Polish Roman Catholic Union of America, the oldest Polish fraternal organization in the United States. Like many ethnic fraternal societies, it served as a buffer between the customs and language that immigrants brought with them and the new traditions and language they were expected to learn upon entering American society. Fraternal societies like St. Stanislaus offered members a place to celebrate their Polish heritage and Roman Catholic faith, while also assisting them with some of the more practical matters of living in a new country, such as securing life insurance and home mortgages. The two volumes in this collection contain minutes of monthly meetings of the Saint Stanislaus Society. The minutes are recorded in Polish. In the summer 1962, future Harvard student Steve Saltonstall became one of the early wave of white northerners who went into the Jim Crow south to work for civil rights. During that summer, he worked with SNCC to organize public accommodations in Cairo, Ill., and with an AFSC crew to help clear brush from a drainage ditch near Circle City, Missouri, encountering local resistance in both places. Saltonstall later became an attorney and currently practices in Vermont. The Saltonstall collection consists of approximately sixty photographs taken by John Engel during his tour with an AFSC crew during the summer of 1962. 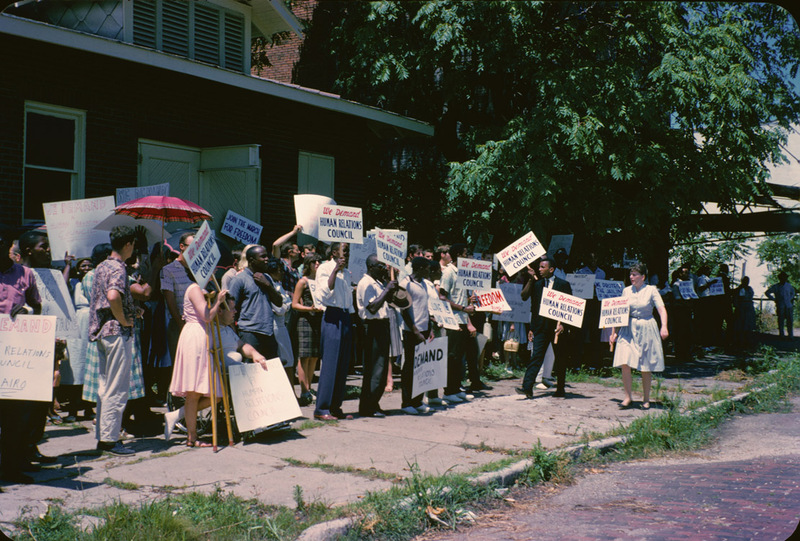 While most of the images depict the crew’s work near Circle City, Missouri, six photos document a civil rights rally in Cairo, Ill. The images are available in digital form only. In the mid-1970s, the Center for the Study of New Russian Literature in the Department of Slavic Languages and Literatures at UMass Amherst began collecting the self-published and underground literature of the Soviet Union as a means of documenting social and political dissent in the Communist state. The Samizdat collection includes writings in several genres — chiefly fiction, poetry, drama, and literary, social, and political criticism — in handwritten, photocopied, and printed form, as well as photos, a passport application for Mikhail Baryshnikov, and memorabilia from an American production of one of the plays in the collection. Iron foundry in Taunton, Massachusetts that produced stoves for individuals and several large local companies. Includes monthly labor payments to workforce of thirteen, as well as monthly accounts of sales, merchandise on hand, and rent. Also documents the company’s worth, annual profits, and the worth of company partners in 1870. Methodist Clergyman; literary and religious scholar. Correspondence, drafts of writings, notes for lectures and sermons, book reviews, course materials, class notes taken as a student, biographical material, and other papers, relating chiefly to Sander’s studies of English and religious literature, his teaching career at several colleges (including the University of Massachusetts) and church-related activities. Includes draft of an unpublished book on the Bible as literature; correspondence and organized material from his participation in Laymen’s Academy for Oecumenical Studies, Amherst Massachusetts (LAOS); and notebook of funeral records (1940-1957). Sandwich Quarterly Meeting was one of four original Quarterly Meetings comprising the New England Yearly Meeting (Wilburite), along with Rhode Island, Dover, and Salem. Formed in the split of 1845, Sandwich oversaw Monthly Meetings in Dartmouth, Nantucket, New Bedford, and Westport. It suffered its own split when the Nantucket Monthly Meeting separated to form an “Otisite” meeting between 1863 and 1911. Sandwich absorbed the Wilburite Salem and Dover Quarterly meetings in 1881, and was eventually merged itself into the combined Rhode Island and Sandwich Quarterly Meeting in 1935. After the reunification of New England Friends in 1944-1945, it became the Narragansett Quarterly Meeting. The records of the Sandwich Quarterly Meeting (Wilburite) include minutes of the Men’s and Women’s meetings from the start of the meeting in 1845 to its merger into the Rhode Island and Sandwich Quarterly Meeting in 1934, along with two volumes of records of Ministers and Elders. One volume containing minutes of the Men’s Meeting (1845-1863) paired with the records of Ministers and elders (1845-1857) is part of the collections of the Nantucket Historical Association.